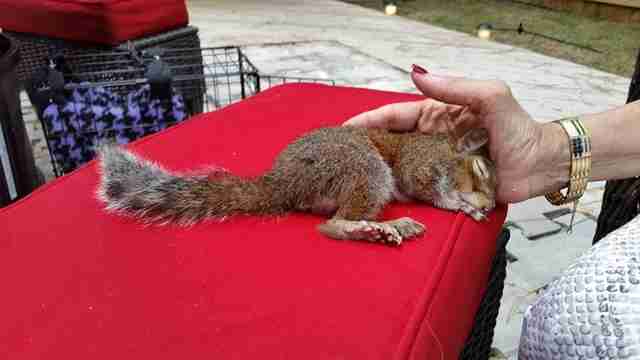 A wildlife rescue gone wrong left a squirrel named Soryn unable to walk, run or jump around like a normal squirrel for the rest of his life. Despite getting off to a rough start, Soryn is now leading a much better life in the hands of people who not only care about him, but know how to care for him as well. 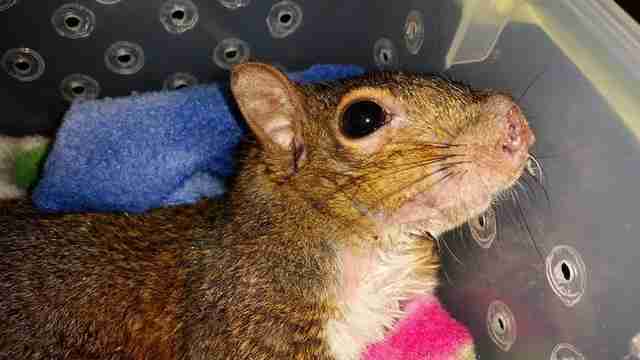 Soryn first arrived at South Carolina's Squirreltopia Wildlife Rescue and Sanctuary in March. 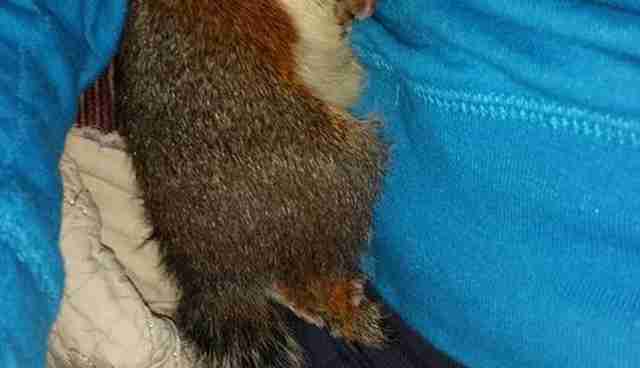 He was found as a baby by a family who decided to keep him and raise him on their own, Laura Ross, founder of Squirreltopia, told The Dodo. However, due to their inexperience, Soryn was fed a poor diet and soon developed metabolic bone disease (MBD), an illness that weakens an animal's bones and can make it hard for them to move or even eat. It frequently happens to wild animals who are kept in captivity. 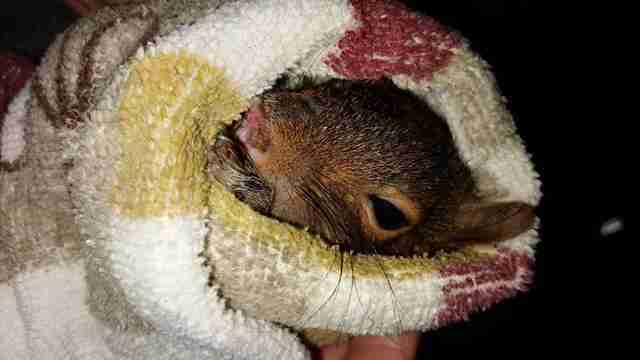 After he fell sick, the people who found Soryn sought out a wildlife rehabilitator to give Soryn to. "The rehabber they found was very inexperienced and didn't treat the MBD appropriately, resulting in permanent, partial paralysis," Ross said. "When he got to me, he had abscesses on his nose and legs from a long-term urinary tract infection left untreated, and his bones were flexible. 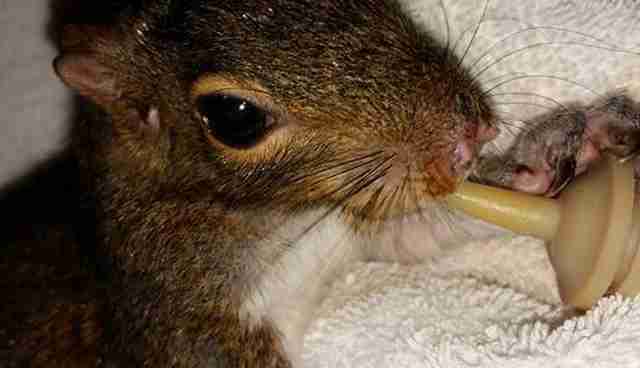 The nose abscess had dramatically eaten away at the skin on his nose - it was horrible." 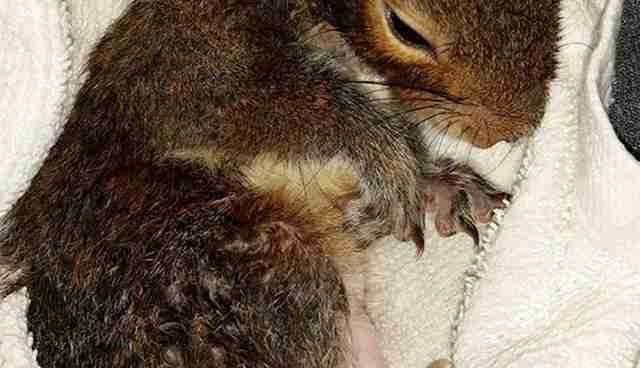 Over the months, Ross was able to treat all of Soryn's diseases and infections, transforming the squirrel from a sickly baby into a pampered 13-month-old prince. 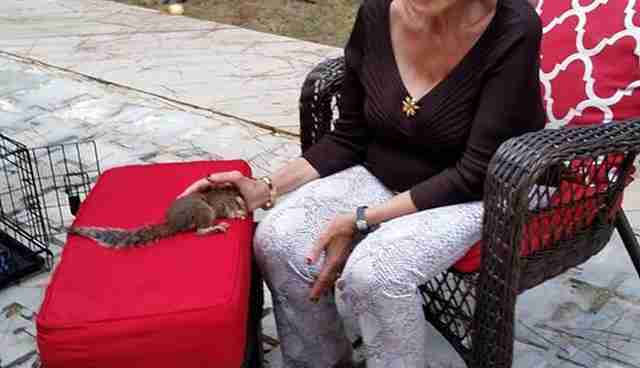 "He gets along really well with all of the squirrels that live here permanently," Ross said. "His personality is very docile and pleasant." He proved that on Wednesday, while visiting the home of a veterinarian friend, Dr. Jacqueline S. Brewer of the Maybank Animal Hospital, who helps Ross research and treat her sanctuary "children." Soryn found a new friend in Brewer's mother, Nahed Shihata, who happened to be in town visiting. 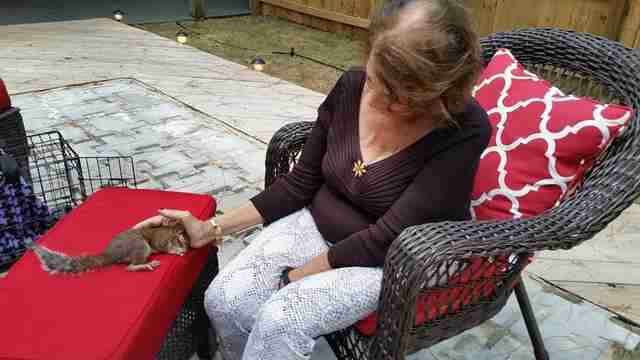 "She simply couldn't believe how loving and happy my sweet boy is," Ross said. "I sat him on the bench seat next to Dr. B. 's mom and he was moving around in his way. She began to rub his back and he groomed her hands ... [and] laid on his back as [she] doted over him, and inevitably fell asleep with Mrs. Shihata gently scratching and rubbing his back. It is typical behavior for him." 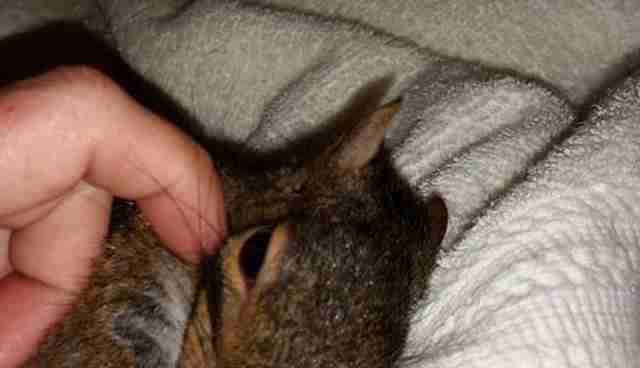 Ross said Soryn sat with Mrs. Shihata for an hour, soaking up the love and affection he received, and noted that even though Soryn has special needs, he is quite a happy and grateful squirrel. 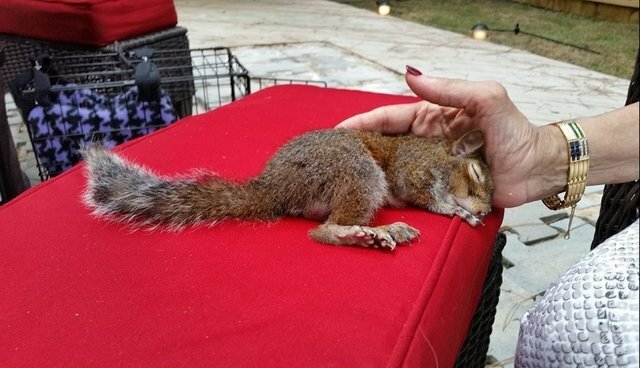 Soryn is also very close with another special-needs squirrel who is a permanent resident at the rescue - a squirrel named Kiersey who has a disorder where the cerebellum of her brain did not fully develop, which affects her ability to move around normally, leaving her with uncoordinated mobility. 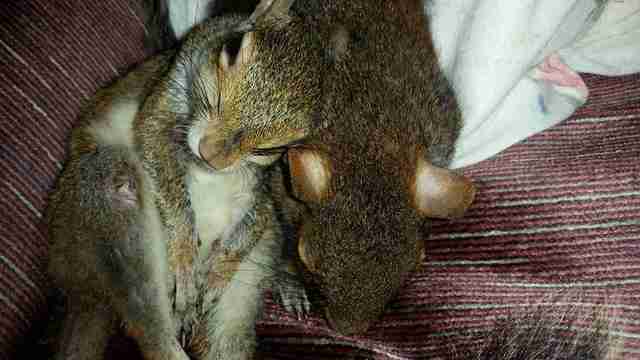 However, Soryn thinks Kiersey is just perfect, and loves sharing his food with her, playing with her and taking naps with her. "Little Soryn just steals hearts everywhere he goes," she added. "He's just a gentle soul." 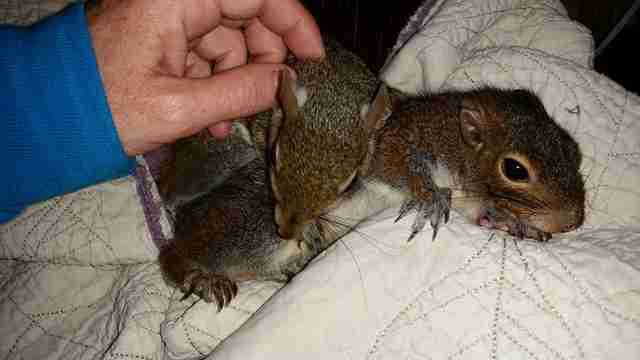 Want to help Squirreltopia continue doing good work for animals in need? Consider making a donation here.